What if all of those 19th-century notions about the nature of the solar system were true? Venus is swampy and rainy, Mars is mostly dry but turns out to be good country for kangaroos, Neptune is covered by an immense and stormy ocean, the moon really does have seas. And more: the moons discovered by modern science are all present, most of them inhabitable, plenty of them inhabited by larger or smaller groups of humans. There are currents in the luminiferous aether that whisk ships to the outer reaches of the solar system in mere weeks. And still more: Pluto and Charon are joined by great, void-leaping vines, while nearly all of the worlds support indigenous life, if not life that the humans recognize as sentient. And yet still more: the people of all the worlds are crazy about movies, with Earth’s moon replacing Hollywood as the industry’s home, but the Edison family have locked down all the patents on color and sound, so most movies well into the 20th century — decades after the first crewed rocket flight in 1858 — are still black and white silent pictures. 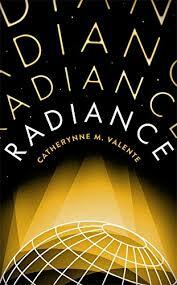 That, more or less, is the setting of Radiance by Catherynne M. Valente, a book that is ultimately about transcendence, but along the way touches on filmmaking, gossip culture, growing up in an artistic family, growing up in a ruthlessly commercial family, art, truth, fiction, conventional morality, metafiction, and a few other things as well. There isn’t really a plot, or rather there are several and they add up to the story that Valente is telling about the setting she has devised and some of its most emblematic people. The book comes together like a documentary film, which is entirely fitting because one of Valent’s main characters is the documentary director Severin Unck, who is the daughter of the commercially renowned director Percival Unck. Valente skips around in the timeline, with some scenes set just after the turn of the 20th century and others as late as the 1960s. She likewise jumps among numerous narrative forms: interviews, movie scripts, meeting transcripts, and several others in addition to narration that appears straightforward genre fiction at first but turns out to be something different entirely. Severin is dead, or thought to be dead, presumed inhumed, at the book’s opening, although for much of its course she is a little girl navigating the moviemakers’ worlds from an unusual perspective. For what turns out to be her final project, she brings her regular crew of filmmakers to the site of a settlement on Venus whose settlers all vanished simultaneously. Similar things had happened on Mars and Pluto, decades earlier. Severin wants to unravel the mystery or, failing that, she wants to make a movie to show the rest of the worlds what they found when they went to have a look. Radiance spirals around the time on Venus, showing it bit by bit, but showing the decades before as well as the effects of that visit on the survivors’ lives. Or possibly showing those effects; there are indications that some of the sections of the book are actually a movie (or movies) that characters in other sections are talking about making. The stories within the book are also about reaching toward transcendence, one of the things that can happen when that barrier is crossed, and the near impossibility of communicating back across it. It is a radiant ending to a book that isn’t quite like anything else.